Acknowledged author David White wrote The Physiology and Biochemistry of Prokaryotes comprising 656 pages back in 2011. Textbook and etextbook are published under ISBN 019539304X and 9780195393040. 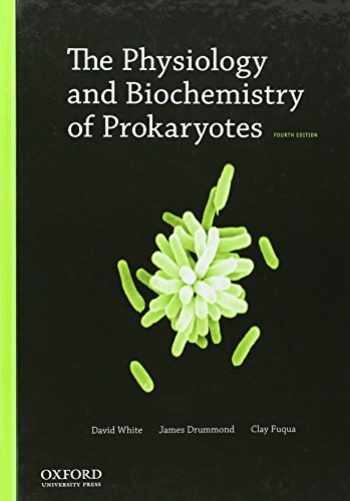 Since then The Physiology and Biochemistry of Prokaryotes textbook received total rating of 4 stars and was available to sell back to BooksRun online for the top buyback price of $55.78 or rent at the marketplace. The Physiology and Biochemistry of Prokaryotes covers the basic principles of prokaryotic physiology, biochemistry, and cell behavior. The fourth edition features comprehensive updates that integrate the latest developments in the field, including genomics, microbial diversity, systems biology, cell-to-cell signaling, and biofilms. The book also presents microbial metabolism in the context of the chemical and physical problems that cells must solve in order to grow. Written in a clear, straightforward manner, the fourth edition adds two new coauthors, Jim Drummond and Clay Fuqua, each a highly respected scholar in his field. The text is organized by topic rather than by organism; this innovative structure will help you to better understand the general principles of physiology and metabolism. Each chapter ends with a summary, thought-provoking study questions, and an extensive list of references to outside research literature that you can access for more information and detailed explanations of material in the text.